Aloha, amigos, I do believe it's time for a progress bump. How's everyone doing? While I've been seeing a lot of screenshots and such floating around in the Discord, it's somewhat difficult to keep up with who's doing what, or particularly any thoughts they may have had about the contest itself. I don't think I'll be able to finish The 7 Days in time. Most of my focus is on Project Gameplay, so I'd like it to stay that way. I think I'll continue The 7 Days later on, but I don't think I can make it before the submission date. It'd be worth it to submit what you have by the deadline at least, the more entries the merrier. Going out in style kiddos. the deadline is still like, several months away. it's a lot of time to make something. Very true, plenty of time to make a 20-ish minute long submission. I'm finally getting work started on my entry. (Currently I'm testing the shop system) Hopefully I can get it done within the next few weeks. Never done modcon, but the rules i don't follow. I'm not participating. It's a little late to join anyways. Unless, of course, you're capable of cranking out a quality entry in a couple weeks. After three months of brainstorming and modding, I present to you my entry for ModCon 2017: Shipwrecked. I was always a confident man, no doubt about it. Even someone like me had to face the facts when that fateful storm bared its fangs, though by then it was much too late. - Lowered HP of Snake boss. Come now, and listen to the tale of this foolhardy sailor. This is really fine work. The writing and the cutscenes in particular... top notch! Did you run out of time? The ending really was somewhat of a cliffhanger after all... Though, you could also call it clever in how you could likely extrapolate that they made it out safely, with the main conflict resolved and the story being told to kids... 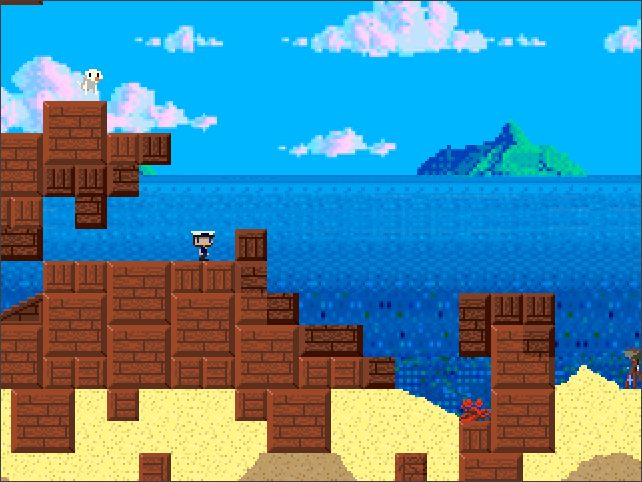 I just wonder if the shipwrecked hero ever escaped the island? Any plans to continue? It ends well, but I would love more adventures. Lots of great detail in this mod btw. Especially fond of the cutscenes where we see Ming in action! I can only imagine a lot of trial and error went into getting him to cooperate... But it turned out great! Anyway... it's late... can't think straight. I'm sure someone else will give you a comprehensive review, but just wanted to shout out that I thought this was a great mod. Contest or no contest. Wait, did it say, "Virus Lab"?! 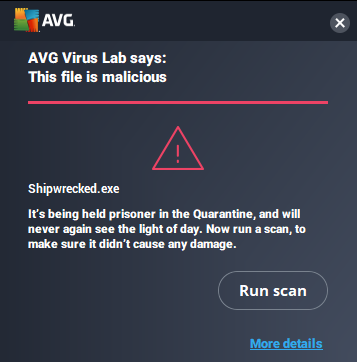 False positive, checked with virus total; it seems like most mods trigger the computer's rage... but I was amused by the message. The plane section gave me quite a bit of trouble, especially near the end in the ammunition room. This was compounded by the fact that due to how I had saved, I could either fight it with very little health or trek alll the way back down, then alll the way back up, while hoping to avoid the crabs in the fuselage on the way. As well, I had to repeat both the room previous and that room every time I died. and the snake... jeeberz creeberz, it's not like it was an especially hard pattern, but you gave it so much health..! the gun can only do so much, and then i'm left to wail on it with the oar for like 10 minutes. Didn't enjoy that very much, especially since the 2nd form has some insta-kill attacks. By the time I beat it I had cheated my way to 32 health and the spur so I could just keep going and enjoy the rest of the content. 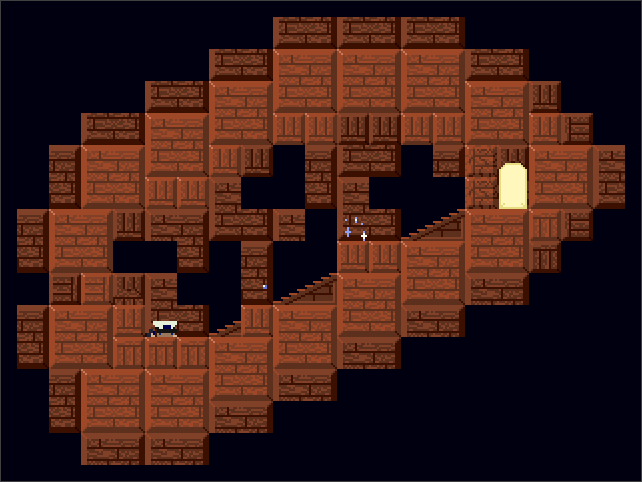 those complaints aside, the dialogue and atmosphere was charming and creative in a cave story mod. I like your explanation for the doritos, and I feel the length was "just right" apart from how many times I had to repeat certain segments. Thanks for the feedback! I'm glad to hear that you two liked the mod, albeit to slightly different degrees. Nah, I didn't run out of time. I wanted to end the mod on a cliffhanger, with a few things being implied by how the ending and the rest of the mod's text were worded. It certainly did a good job of keeping the player hooked, I see. I also got a chuckle out of your reaction to Ming and Toko's names. I guess it was a little more subtle than I gave it credit for. Sad to hear that the plane gave you that much trouble. A friend who streamed the mod had trouble with the crabs as well, and to remedy that I added skipflags to all of the plane's encounters as opposed to just the snake boss. As for the snake boss itself, my reasoning behind it having a fair bit of health was that it constantly stopping after slithering forwards gave the player ample time to run up and rapid-fire the Oar a bit before being forced to dodge again. It also allowed the boss music to reach its main loop. Regardless, I may have overdone it a bit given your feedback; I'm going to upload a new version with lowered health ASAP. In regards to your point on insta-kills, there's only one attack that can actually insta-kill in Phase 2: getting crushed after its big leap into the air. I decided that it was a little more forgivable considering how much time there is between it leaping up and it crashing down combined with it always landing in two specific places. Depending on if you find a certain secret, even that attack goes from an insta-kill to just a particularly painful one; who would've guessed that a few points of HP would make such a big difference? After reading everything, I think a quick update to v1.2 is called for. There will be a one-time extension to cushion last-minute submissions and encourage that extra drop of polish and playtesting. The deadline is being extended to 11:59 PM, CST on Monday, September 4th. There will be no further extensions. Please send anything you have to me via DM's or notify me of a public release before that time so I can package and deliver to the judges. You can have as many updates as you need before that time, so there's no harm in at least having something on file in case the unthinkable happens. I can't wait to record myself blindly playing the contest entries, alongside giving any tips and feedback on the mods! I hope to see great things from this year's contest! I'm not promising a return to making a mod for next year's contest, but you'll never know for sure! C H I C K E N ? ? ?